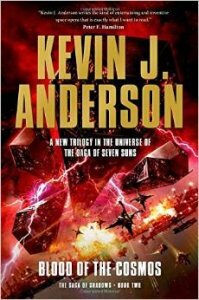 I am on record as having thoroughly enjoyed the first five volumes of Kevin Anderson’s series, The Saga of Seven Suns. 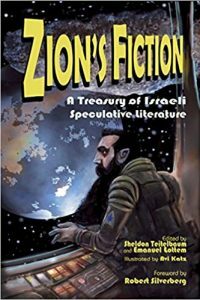 The books showed Anderson incorporating everything he had learned (by helping Brian Herbert to extend father Frank’s Dune mythos) into a fully conceptualized space opera of his own that resonated with all the classics of that mode, yet which also felt fresh and unique. But by the sixth installment, Metal Swarm, which I reviewed for the late, lamented Scifi.com, I felt that the events of that book were protracted slightly, and that the arc of the whole series might have benefitted from a faster climax. Consequently, I fear, I let the final book, The Ashes of Worlds, slip right past me. But now that two volumes of the sequel trilogy, The Saga of Shadows, are out, and especially since the first claimed a place on the Hugo ballot, I was moved to resume the series. I cheated a bit by swotting up on Volume 7 online, without actually taking down my copy from the shelf, but have started anew with a read of The Dark Between the Stars (one of those perfect, archetypically stefnal titles which also happens to be attached to story collections by Poul Anderson and Damien Broderick). The internal continuity of the initial new volume finds the galaxy advanced by twenty years from the events of the Elemental War that occupied the first Saga. Generally, peace reigns. The belligerent fire and water aliens have retreated to their native ecospheres, and the humanoid aliens, the Ildirans—with whom humans have created hybrid offspring, and who originally gave humans their stardrive—are friendly once more. The evil insect aliens, the Klickiss, and their war robots, have all disappeared from the scene as well. Human factions are generally amiable among themselves. But of course, such a mild-mannered era would hardly merit a space opera scenario, and so new complications arise. The main villain/disaster/threat this time is from the Shana Rei, invisible creatures who seem more or less embedded subdimensionally into the spacetime continuum since before the rise of sentience in the galaxy (a very Rudy Rucker-esque concept), and who are affronted by us upstart sophonts and wish to wipe us out and restore a blissful quiet to the cosmos. The hidden remnant of the Klickiss robots ally with them, and attacks begin with a combination of entropic fields of darkness and good old robot warship depredations. I must say that these villains—the insane and hateful Shana Rei, and the robots led by the megalomaniacal Exxos—steal the show with their dastardly ambitions whenever they are on stage. But this main MacGuffin, as you might imagine in a volume of some 700 pages, is bolstered and counterpointed by numerous subplots. One of the most intriguing thread involves the medical researches of a certain woman named Zoe Alakis and her catspaw, the sociopathic Tom Rom, and a diabolical new plague. Similarly vital is the discovery of a new kind of interstellar, vacuum-dwelling alien, the “bloaters,” who prove useful in a number of ways. There’s a freshet of new characters introduced, and we also get reacquainted with many old favorite protagonists. Anderson’s chosen narrative matrix features shifting third-person POV across nearly 140 chapters. But he does not merely cycle through his cast arbitrarily. Instead, he uses the jumps either to produce cliffhangers or to counterpoint or laterally advance the action. This complex, thoughtful arrangement is a mark of his skills. Blood of the Cosmos delivers plenty of original developments, not all of which should be revealed in this review. The war with the Shana Rei and the robots continues its teeter-totter progress, with the enemy’s ability to mind-control humans and Ildirans wreaking disasters galore. Most dramatically, a new alien race appears, the Onthos. They claim to be old victims of the Shana Rei, and also the former guardians of the Theroc forest mind. They are given refuge—but are they what they purport to be? New weapons get developed and tested. Several microscale threads, such as Prince Reyn’s illness and its intersection with the eccentric researches of Zoe Alakis, are advanced. Anderson is always willing to take a little scenic detour away from the galactic tsuris, such as a thrilling and bloody wyvern hunt. I think it safe to say that after eight volumes in this franchise, Anderson is not going to deviate much from his trademark methods or themes, so the reader is assured of getting lots more of what he or she already enjoyed. Which is not to say that there are no surprises in store. One notable aspect of this series is Anderson’s granting of nearly equal time to the “little people” as well as the big players. Few current or past space operas do that. But here, one chapter can be told from the POV of the Mage-Imperator of all Ildirans, while the next follows the humble doings of Garrison Reeves, Roamer miner. A very interesting character arc is that of Lee Iswander, who is a merciless capitalist, and yet who steps forward with a big altruistic gesture when he realizes the fate of civilizations is at stake. This middle installment concludes with affairs in a vastly different configuration than they were at the start of the novel, and portends even greater doings ahead. Above the planet, empty space tore open and black geometrical horrors emerged. Long hexagonal cylinders slid out like blunted knives of pure obsidian. The very presence of the Shana Rei ships exuded chaos, unraveling coils of capricious entropy that made the systems aboard the flagship warliner malfunction, flicker and fail. A flurry of metallic hornets emerged alongside the hex ships, black robot warships that swooped forward in search of targets. Though their primary target was the Hiltos shrine on the surface, they spotted the Solar Navy flagship and immediately opened fire. If you can enjoy and get behind such Skylark of Space shenanigans, then Anderson gives just what you need, in cosmic-sized quantities.